Will North America Become the Next Saudi Arabia? Colleges in the Age of Enrollment Management Engines of Opportunity or Perpetuators of Inequality? Palestine at a Crossroad Are Multilateral Initiatives the Only Hope Left for the Cause of Peace? 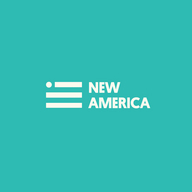 New America is a nonprofit, nonpartisan public policy institute that invests in new thinkers and new ideas to address the next generation of challenges facing the United States.